It was time for a change, said Larry Pettinelli, the president of Patek Philippe North America, and Thierry Stern, the company’s CEO, when we dropped by the company’s spacious and and welcoming new offices at 45 Rockefeller Plaza. It’s the first relocation of Patek Philippe’s offices in New York in 22 years, and the company’s got room to grow and then some –at 34,000 square feet, more or less, it’s around double the size of the old space. 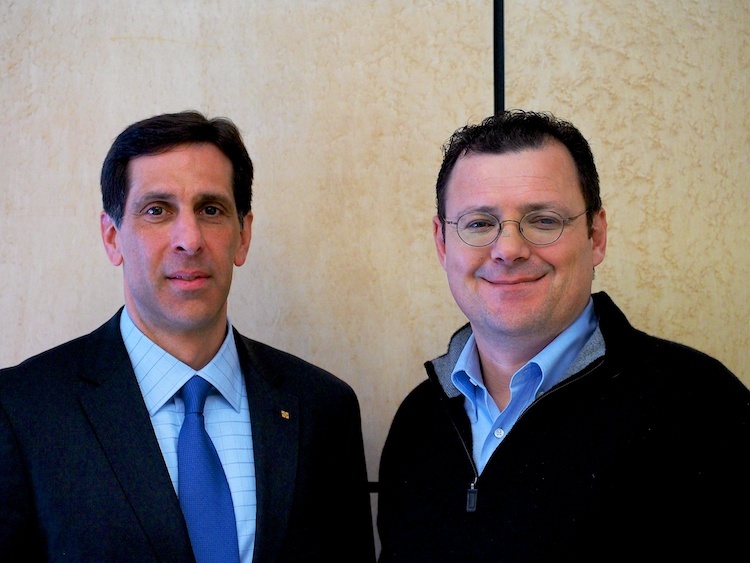 “Part of the goal,” said Mr. Stern, “is to expand the capabilities of our service center. 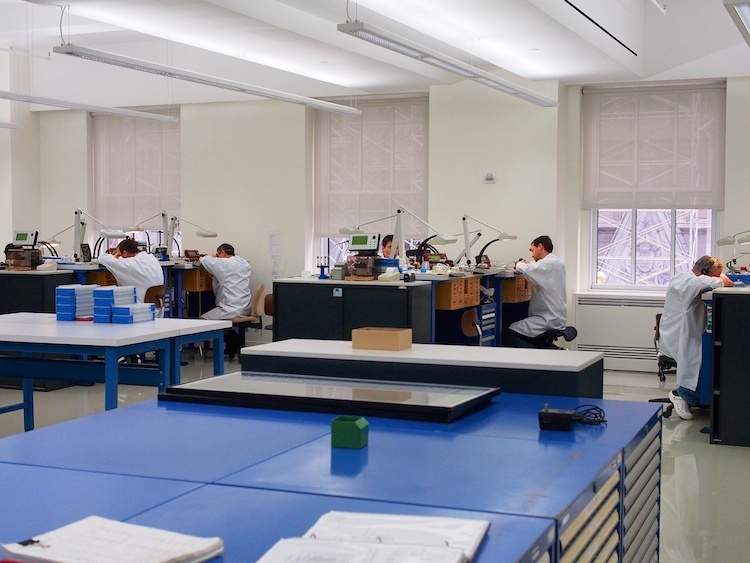 We have 18 watchmakers now and we have the capacity to have up to 40.” it’s difficult to become a Patek Philippe watchmaker –the company has its own internal training program, and standards are so high that a watchmaker of several years’ experience with another brand might find themselves starting out at Patek working only on quartz movements. Despite the slow and steep learning curve, though, Stern told us that many watchmakers come to appreciate the difference in culture, and the meticulously careful approach to service that’s so essential at Patek Philippe. 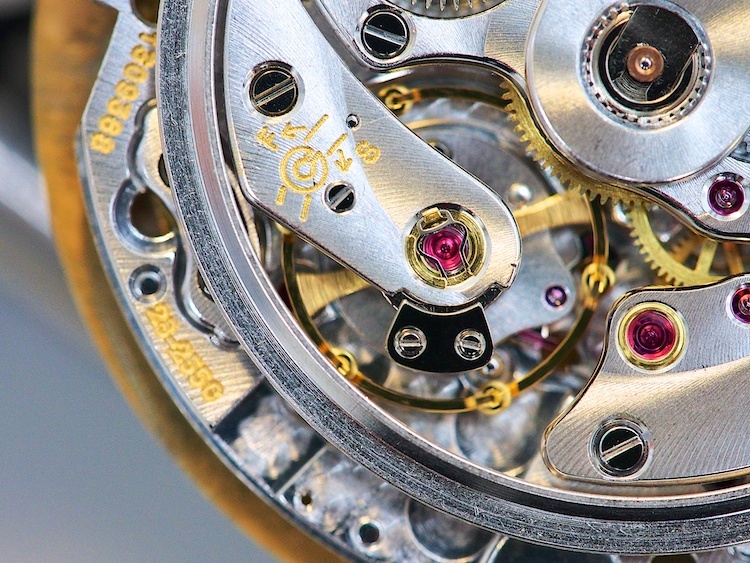 The service center is equipped and staffed to handle very complicated watches –up to and including perpetual calendar chronographs –but some very complicated pieces, including minute repeaters, are still sent to Geneva. For one thing, though it’s well known that Mr. Stern personally checks each new repeater for tone, volume, tempo, and feel in operation, we were surprised to learn that he does the same for repeaters that have come back for service, to ensure they’re performing up to expectations before they return to the owner. 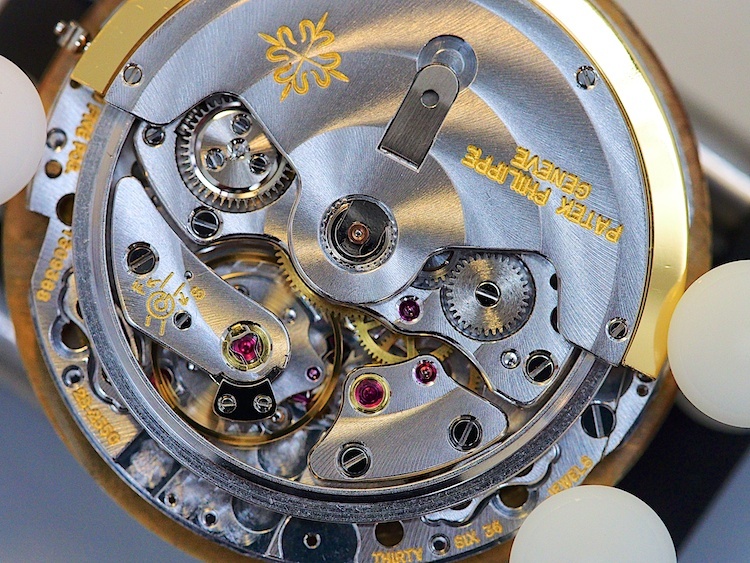 In the service center, we had the opportunity to see work-in-progress, and we were lucky enough to be there on a day when two of Patek’s most beautiful movements were out of the watch cases in which they’d been brought in. 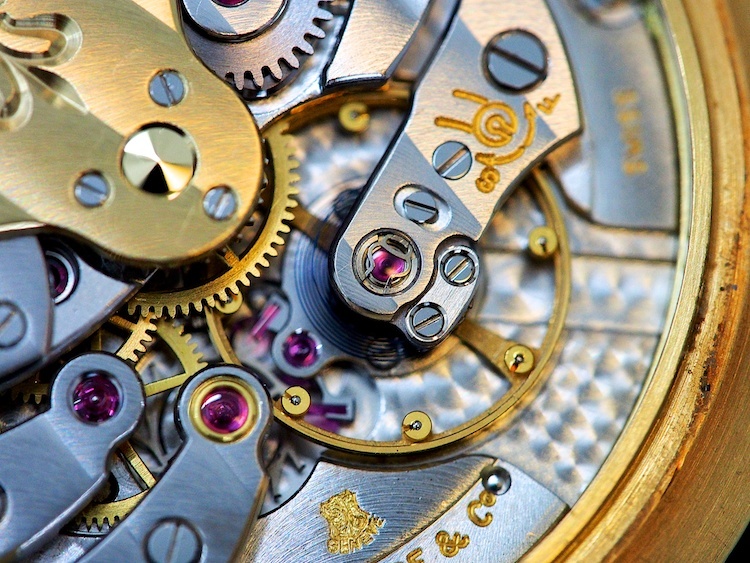 The first is the movement made by Jaeger LeCoultre as the calibre 920, though as Walt Odets notes in his classic article for Timezone.com, Jaeger never used the movement themselves. It has the distinction, however, of having been used by all the “Big Three” watchmaking houses –at Vacheron Constantin, as the calibre 1120; at Audemars Piguet as the calibre 2120; and at Patek Philippe, as the calibre 28-255, where it was used for the first ten years of the production of the Nautilus. This particular movement runs in a vintage Nautilus, and its superb finish and unusual design haven’t lost any of their charm. 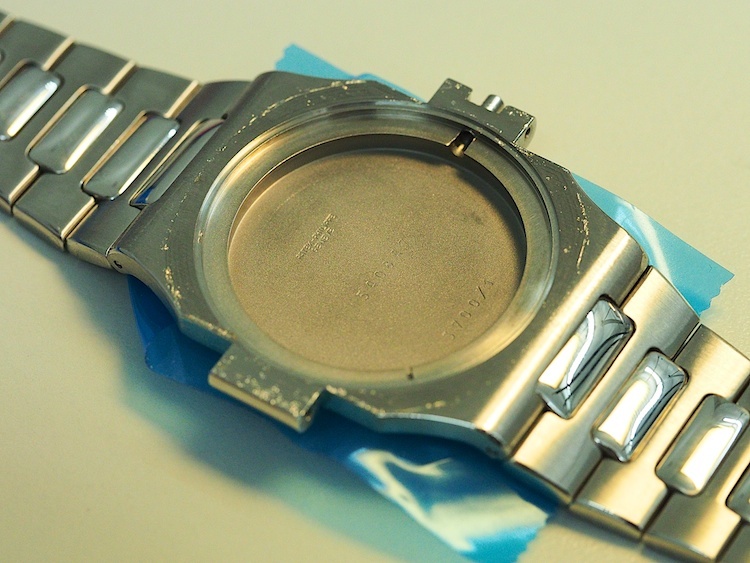 The thin dimensions (2.45mm) mean that the rotor has to be stabilized by running on four ruby rollers on a peripheral beryllium ring. 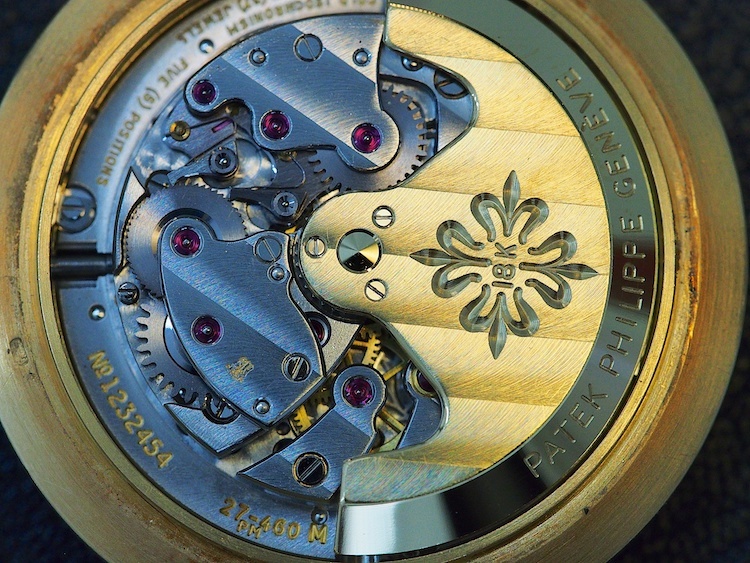 Even after many decades (the movement debuted in 1967) it’s still the world’s thinnest full-rotor automatic movement. 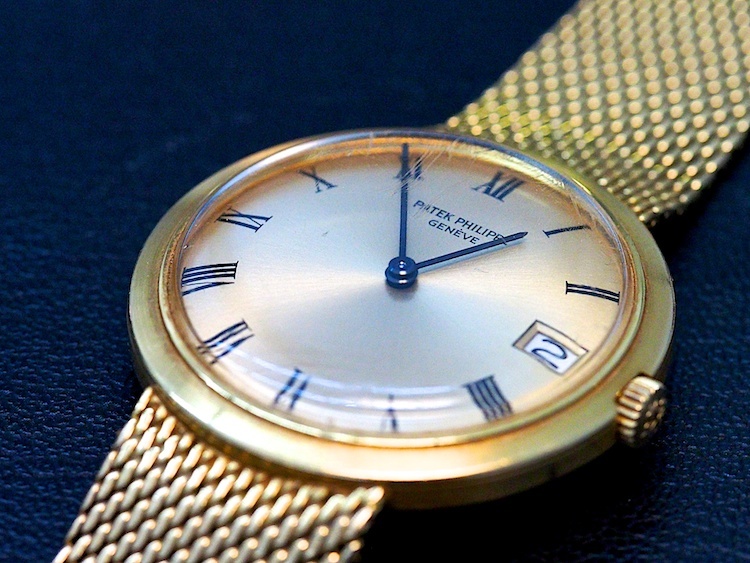 The other splendid vintage movement we saw is the engine in a beautiful gold-cased vintage Patek self-winding watch with a lovely, supple gold bracelet. The movement is the calibre 27-460, an in-house self-winding movement first released in 1960; the 27-460 is an evolution of the earlier Patek calibre 12-600 AT from 1953. The movement is very solidly built, designed for long-term reliability and accuracy, and features (in addition to its drop-dead gorgeous finissage) a classic Gyromax balance with Phillips overcoil balance spring. 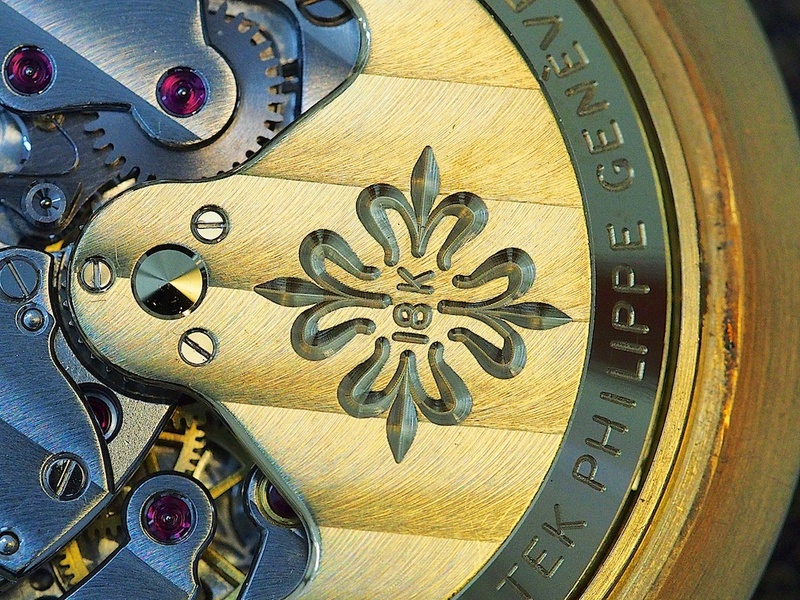 Up close, it’s a joy to behold –there’s nowhere you can look without seeing some of the most thoroughly, consistently excellent classic Genevan style finishing ever lavished on any movement. Though the level of discourse with respect to Patek tends to revolve these days around investment value and cost, it’s not a bad thing to be able to see, up close and personal, the reasons why Patek Philippe watches are so respected and have kept their value so well. Though, of course, the fact that Patek watches have a reputation for holding their value (and in some instances appreciating dramatically, as a cursory examination of any watch auction results will show) doesn’t hurt. Still, Thierry Stern wishes you’d wear your Patek.